Access to this prestigious sea front development via a secure intercom entry system. The lifts and communal areas are also accessible from the gated underground car park. The well presented accommodation comprises a welcoming entrance hallway, multiple storage cupboards/airing cupboard, modern fitted kitchen with integrated appliances, matching modern fitted three piece bathroom and en-suite to the master bedroom, master bedroom and the lounge/dining room benefit from sliding doors to the balcony boasting sea views onlooking Old Harry Rocks and The Purbecks. Three double bedrooms, central heating and double glazing throughout. Allocated secure underground parking. 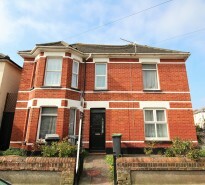 This desirable property is offered with a Share of the Freehold and No Forward Chain. For verification, enter the code as displayed above.